Clay senior Hannah Oliver signed her letter of intent to play softball at Shawnee State University on Monday. PORTSMOUTH – At her signing ceremony Monday afternoon, Clay senior Hannah Oliver signed her letter of intent to attend and play collegiate softball at Shawnee State University. 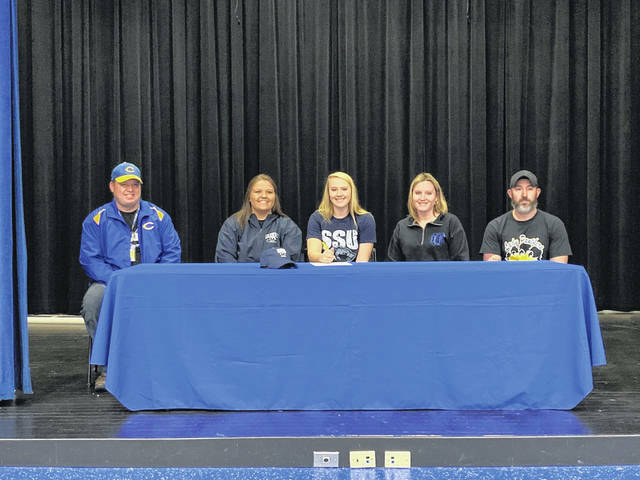 Of course, Shawnee State’s proximity to home was a big factor for Oliver when making her decision, but there were other factors that went along with the ability to play in front of friends and family on a consistent basis. Upon enrolling at SSU, Oliver plans on majoring in Chemistry before enrolling in pharmacy school after she receives her undergraduate degree. As one of eight seniors and being a key component of one of the most stories softball programs in the state of Ohio, Oliver hopes to make another deep postseason run in her Panther uniform before graduation this May. Being surrounded by friends, family members, and teammates at her signing is something Oliver will never forget after her senior season and as she transitions into the next phase of her playing career.